First Lt. Herman Davis, the platoon commander of the engineer platoon from Battalion Landing Team 1st Battalion, 2nd Marine Regiment, 24th Marine Expeditionary Unit, and Henderson, N.C., native, helps members of the Uganda People’s Defense Force inspect their weapons as they prepare for another day of training in Uganda. 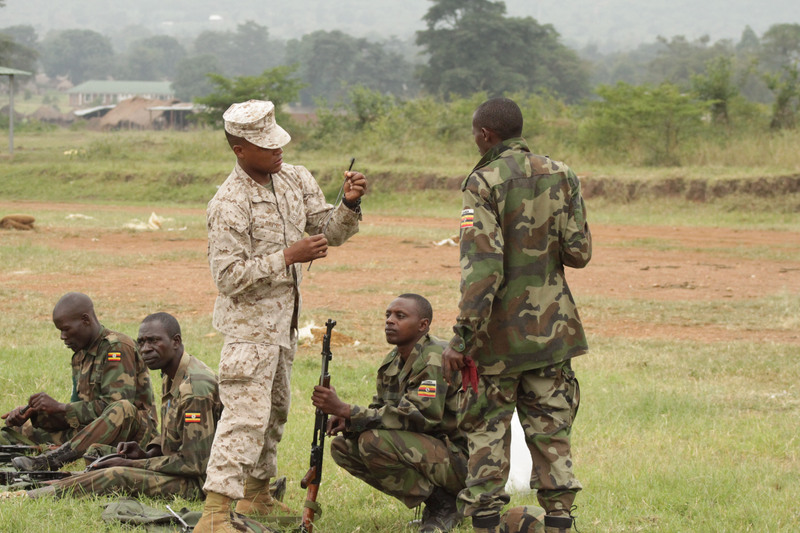 Davis is serving as the team leader of a small group of Marines from the 24th MEU who went to Uganda to participate in a training mission involving basic marksmanship, small unit tactics, and engineering. The Ugandan forces participating in the training are expecting to deploy in support of the African Union Mission in Somalia. The 24th MEU is deployed with the Iwo Jima Amphibious Ready Group as a theater reserve and crisis response force in the U.S. Central Command and 5th Fleet areas of responsibility.